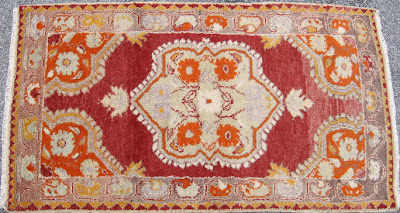 If you are planning to do some weekend antiquing in Atlanta, don't forget Allan Arthur Oriental Rugs on Bennett St. Arthur is currently offering 20-40 % off all antique, vintage and contemporary rugs. 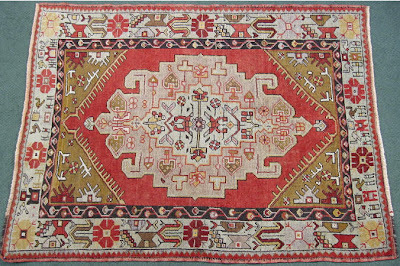 And for a wide range of informative links and sources, visit his site Cyber Rug. 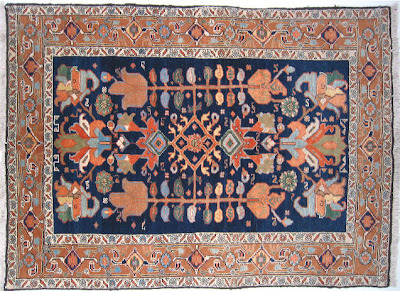 Shown top is a Turkish Oushak, circa 1930, followed by a contemporary Anatolian and a mid-20th-century Persian. BTW: Arthur has a great selection of small rugs. 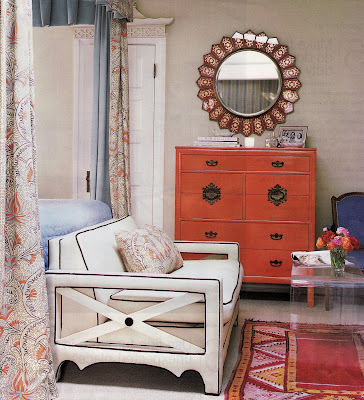 Perfect for layering, or grounding an eclectic room as Ruthie Sommers did in this oft-posted bedroom from InStyle Home spring 2007. 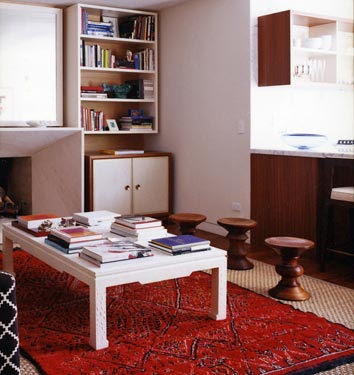 Barrie Benson is also a fan of these patterned rugs, as seen in domino. Four hundred years of British country houses, beginning with the era of Henry VIII, are discussed in the V & A's 15-minute online video. 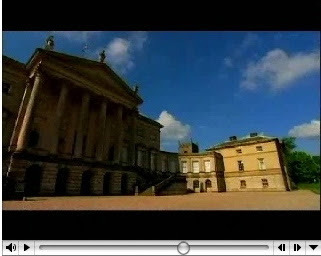 A host of other short videos related to decorative arts are available on the Museum's site too. 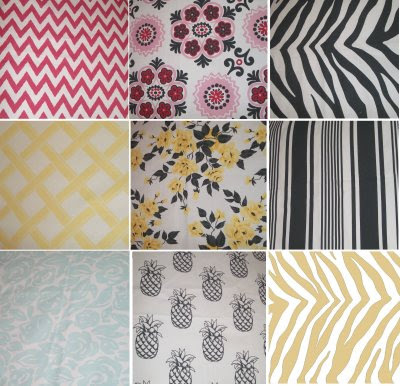 I have to add my voice to the chorus of praise for Michelle Adams' striking new fabric line, Rubie Green. As you no doubt have seen in the March domino, ecco-friendly never looked so chic -- or unapologetically pretty. Look for an expanded website showcasing the line to debut soon. Visit Michelle's blog to learn more. 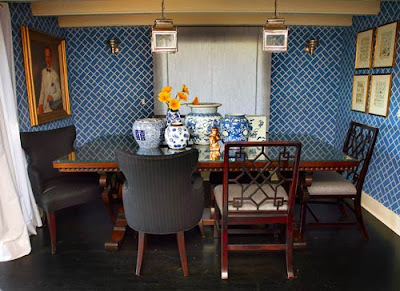 I think many of us are fans of the Jonathan Adler wallpaper, "Bamboo," used by designer Betsy Burnham in the dining room of Pushing Daisies creator, Bryan Fuller. So I thought you might like to be reminded that this pattern is in stock and available for order. 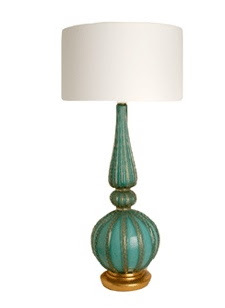 Burnham selected a custom blue but "Bamboo" comes in the standard colors, chocolate, green and silver. 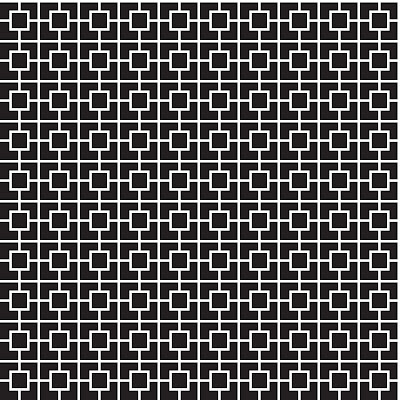 Another great JA geometric wallpaper is "Nixon." 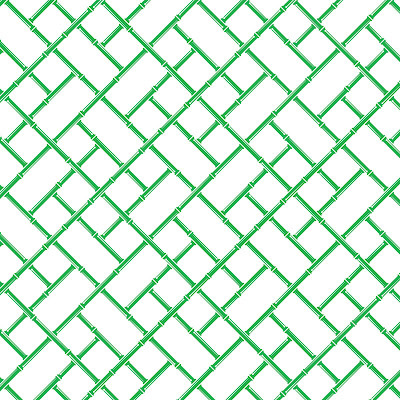 Visit Adler's site to see more. Photography, Barbara Davidson for Los Angeles Times, Adler product images courtesy Jonathan Adler. 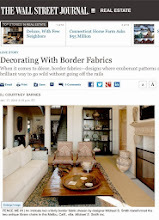 Released not too long ago, Plants and Their Application to Ornament has already received attention from Vanity Fair, O at Home and Vogue Living. The beautifully produced book is based on 19th-century graphic designer Eugene Grasset's original primer and features three artistic variations on each of 24 flowering plants, ranging from lily-of-the-valley to the iris. Grasset, who designed furnishings for the Parisian night spot Chat Noir, was a key figure in the Art Nouveau movement. So this volume will especially appeal to fans of that style. 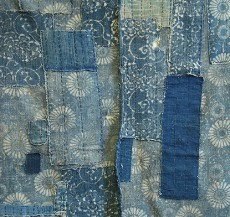 But I do think the book would be a nice addition to the library of anyone passionate about art history, textile design and decorative arts. Grasset shows a creative progression from flowers rendered naturally to blooms in a very stylized, abstract form. 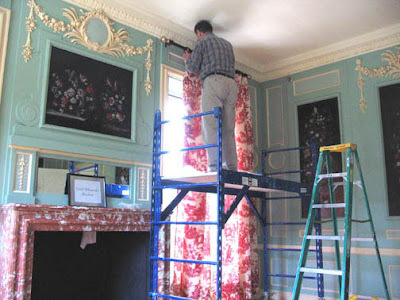 As David Becker of the MFA, Boston points out, Grasset also takes care to demonstrate many practical applications of the floral designs to wallpaper, ceramics, architecture and so on. The casual pics I've shared here don't do justice to the lush colorplates. 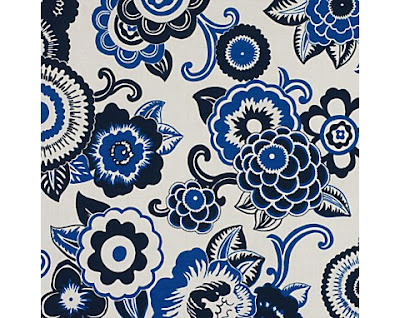 Wouldn't it be interesting to see the design process that led to Quadrille's stylized floral, "Contessa?" 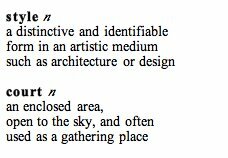 And rounding out this week filled with Tulane references, here's a piece I used to see countless times per week at the High. 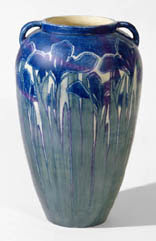 Part of the Museum's Virginia Carroll Crawford Collection, it's a circa 1910 vase with abstract flowers from Newcomb Pottery, New Orleans; thrown and fired by Joseph F. Meyer and decorated by Anna Frances Simpson. "There are only so many variations on sofas and chairs. 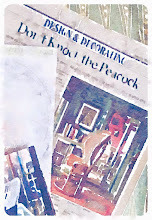 The expression of a room really comes from the smaller items (art, lamps, accessories). So go scour your mom's attic for those treasures!" 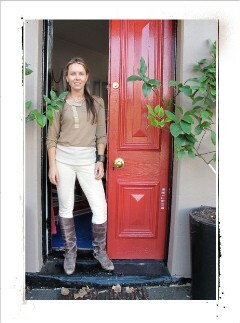 Adrienne, a Tulane grad with style to spare, says she found herself surrounded with inherited antiques. Lovely things, but pieces that did not reflect her youthfulness. 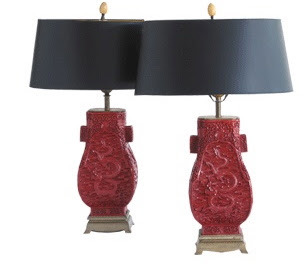 To invigorate her home, she "threw some cheeky red lamps in and --presto--I had a little sass in the room." "No other shade will get you as far as a straight drum shade. An 18" drum shade works on 90% of my lamps. 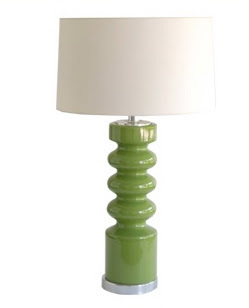 They are so versatile...they can tone down a crazy lamp and make it look more stately. 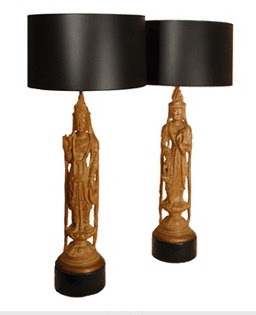 They can also re-invent an otherwise maw-maw lamp and make it a little more current. I prefer silk or linen." 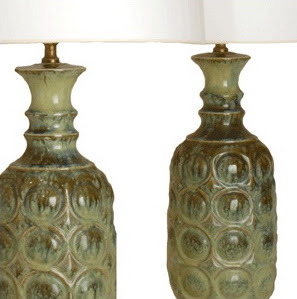 She adds, "If you have a great pair of lamps, a lined shade can help cast the light down on the lamps to showcase them more. That simple thing makes more difference than you can imagine..."
And Adrienne says, " Go oversized! 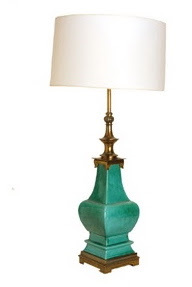 Part of what I love about vintage lamps is their large scale. They just don't make them like that anymore. 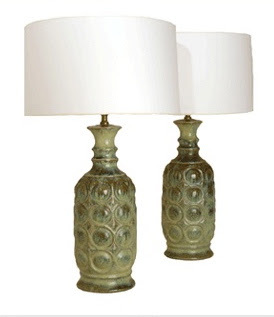 A large lamp or pair of lamps can really fill up a space (especially with our 14 foot ceilings here in New Orleans). 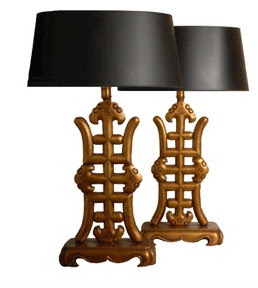 Lamplight is more flattering -- for you and for the room." She continues, "I must say -- a lot of my inspiration comes from this city. 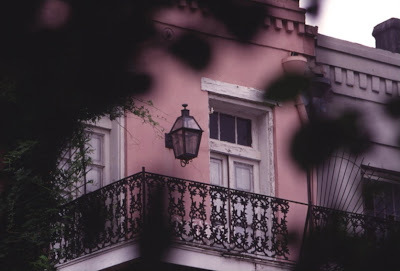 Whether it is music, food or decorating...New Orleans doesn't do it like anyone else. The city really nurtures creativity and entrepreneurship. 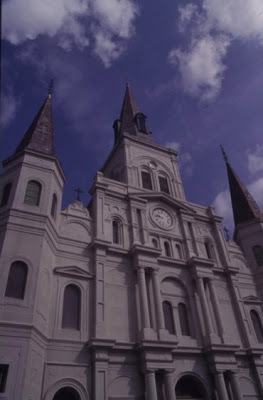 We have beauty at all levels whether it is that perfect po boy sandwich or that divine meal at one of the greats...same goes for art. My favorite painting is from a street artist who sits on the street corner outside of St. Louis Cathedral in the French Quarter. Chain stores and restaurants have never done very well in New Orleans (Houstons and Starbucks have both gone out of business here) because everybody here honors the little guys....the street performers, the mom and pop antique shops, the hole in the wall restaurant run by a husband and wife. The city is full of character (and characters). There are treasures everywhere here!" Currently Casbarian is donating a portion of proceeds to New Orleans area not-for-profits. 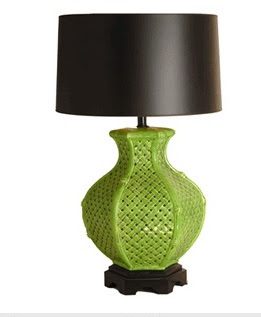 Shipping is available at a flat rate of $50 per lamp and $20 per shade. C. Bell currently has in store a pair of vintage, circa 1988 McGuire chairs with double dragon turquoise-and-white cushions. 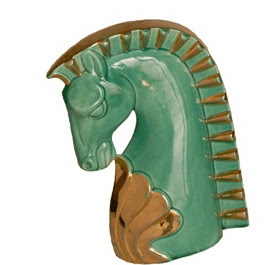 The teal blue ceramic table with camel's leg base is from Marseilles circa 1917. Reminder: Gotheborg is a great resource for learning about symbolism and common motifs, such as the dragon, in Asian design. 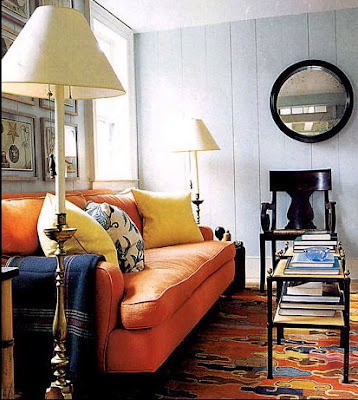 I have not forgotten about the reader's request to find a rug similar to this vibrantly colored one used by Steven Gambrel. In fact, I'm still searching. 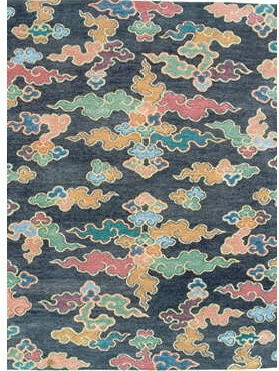 Although it looks very contemporary -- very Rug Company -- there are antique Tibetan designs that resemble it. 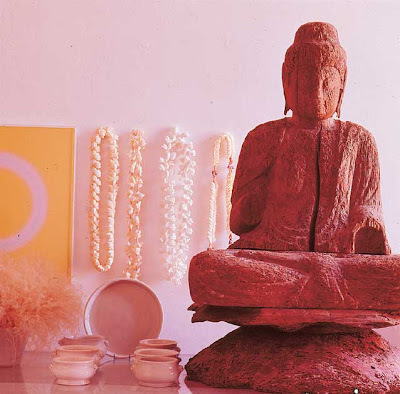 Image is from Elle Decor's September 2001 feature, "Yankee Hip." 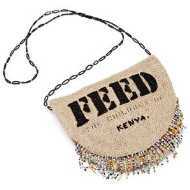 How do some tastemakers pull off a look -- like hanging necklaces or beads on a wall -- that in lesser hands would look way too contrived and cutesy? Here from a few decades ago, a masterful vignette by David Hicks. 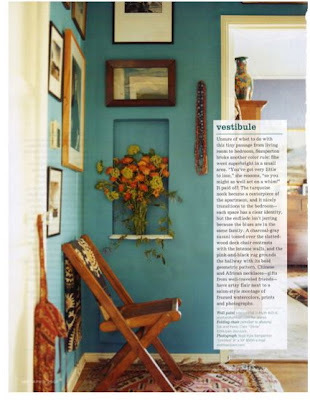 Schuyler Samperton's vestibule photographed by Paul Costello for domino, April 2007. 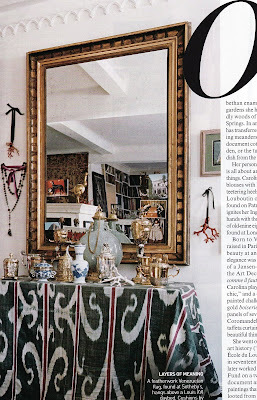 Carolina Irving's distinctive collection photographed by Francois Halard for Vogue, October 2006. Personally I'm a simple den girl, not so much a media room person. But I could easily escape to this cozy-chic Suzanne Rheinstein-designed screening center and watch any of the movies discussed here this week. Rheinstein's plan for Elle Decor included Bose speakers concealed by library-ish linen covered walls with nailhead-studded grosgrain trim. 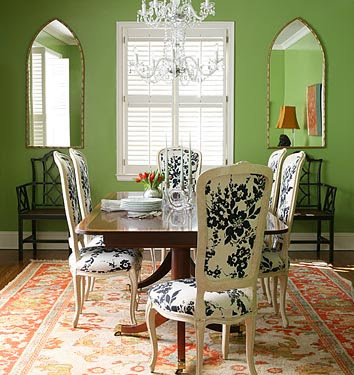 She included plenty of shelving for books, and backed the Roman shades with blackout material. The antique engraving was meant to swing aside, revealing a custom TV. Earlier this week, Joni reminded me of the striking interiors seen in so many Woody Allen movies. One of my faves is Everyone Says I Love You. 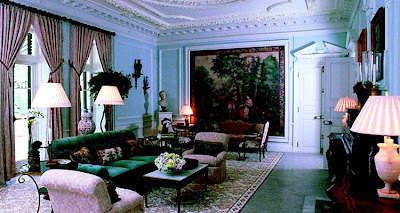 Although the film was shot in the '90s, the trad Park Avenue residence featured is full-tilt '80s. Rather Buatta-esque. 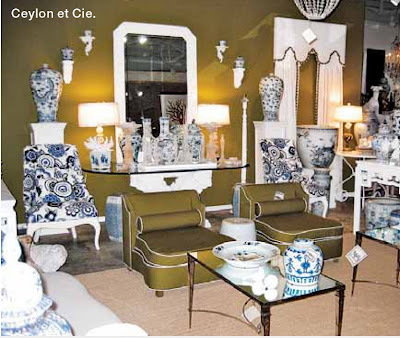 A reader asked me to identify the bold blue-and-white fabric on these chairs flanking the console in Michelle Nussbaumer's elegant Dallas shop, Ceylon et Cie. I thought first I'd turn to my talented savvy readers. Thoughts? Update: A huge thanks to Anna Spiro for directing us to Ralph's "Poolside Floral." 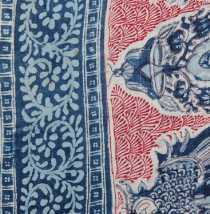 In most of her writings, Edith Wharton expressed disdain for wallpaper. It was an element she saw used to extremes during the Gilded Age. 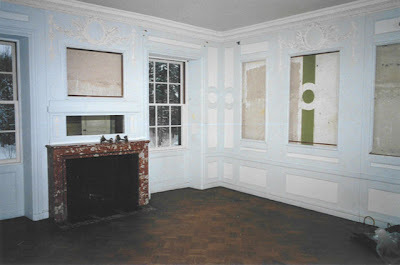 But during the ongoing restoration of her New England estate, The Mount, curators discovered fragments of 11 different wallpaper patterns. Some remnants even popped up in her bedroom suite. There's an interesting article about Wharton's contradiction on The Mount's official site. All images courtesy The Mount. 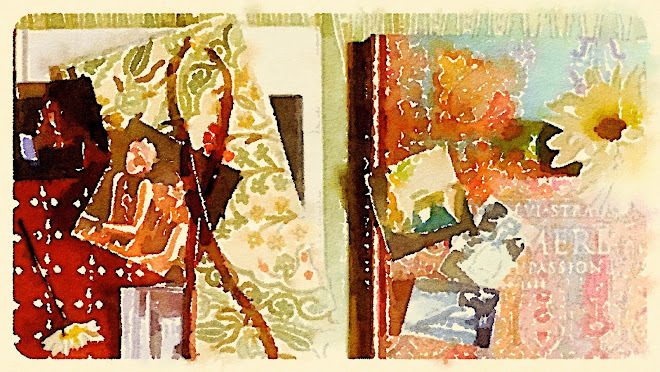 The top two show restoration work in Wharton's bedroom, and the third is the author's drawing room as interpreted by Charlotte Moss. Just received my catalog for Sotheby's upcoming sale of Indian and Southeast Asian Art on Wednesday, March 8. 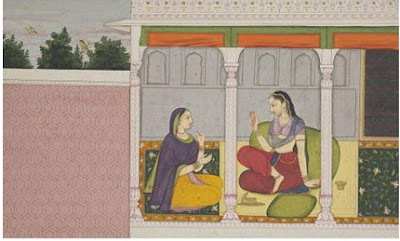 As always, there is endless color inspiration to be found in the tiny paintings such as this circa 1780 Indian watercolor, measuring roughly 6 by 9 inches. It puts others to sleep, but I love studying the history of fashion, art and architecture as a jumping off point to learn about broader issues. Young historian Caroline Weber's book, Queen of Fashion, did this brilliantly. And tomorrow night, those of us in Atlanta have a chance to hear what Diana Reid Haig has to say about France's first Empress, Josephine. Just a reminder, the free talk takes place at the High on Thursday, February 21 at 7 p.m. Among my own things, I couldn't find any examples with an empire waistline -- well, except for little tops in my closet; this 19th-century American watercolor (a gift meant to remind me of my Virginia roots and the value of education) was as close as I came. Best Movie Scene Related to Decorating?